British Columbia (BC) is rich in natural resources, and the extraction of these resources has been linked to historical processes. 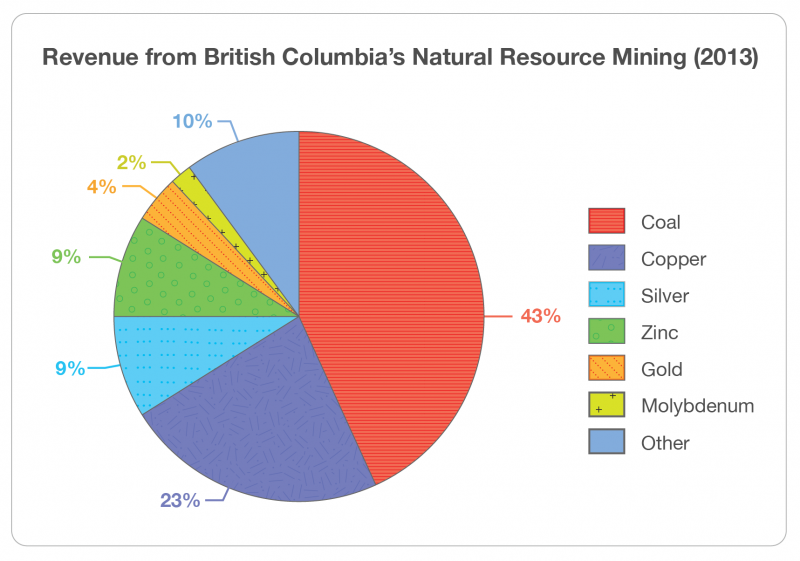 In British Columbia, there are 3 primary natural resources that have deep connections to the provinces past; mining, forestry and fisheries. In later chapters we will explore the fisheries and forestry in more detail. In this chapter, we’ll examine mining in British Columbia. With the signing of the Oregon Treaty in 1846, boundary country opened up and the exploration of BC’s mines grew massively. The mining of coal, metals and minerals began with the gold rush in the 1850s and continues today. Coal and gold were both mined before the gold rush started. Gold finds were small and only mined for short periods. Gold was predominant until silver was discovered in the late 1800s in the Kootenays. Mining is estimated to be worth $5.6 billion for the province, almost double what it was in 2001. The gross mining revenues for the mining industry were $8.5 billion in 2013. The number of people working in BC’s mining industry in 2013 increased to 10,720 up from 10,419 in 2012. Vancouver is the world’s leading centre of expertise for mineral exploration, and there are at least 1,200 exploration companies located in BC. Coal accounts for 39% of the total volume handled at the Port of Vancouver, which moves shipments to China, Japan and other Asian markets. Figure 4.2. 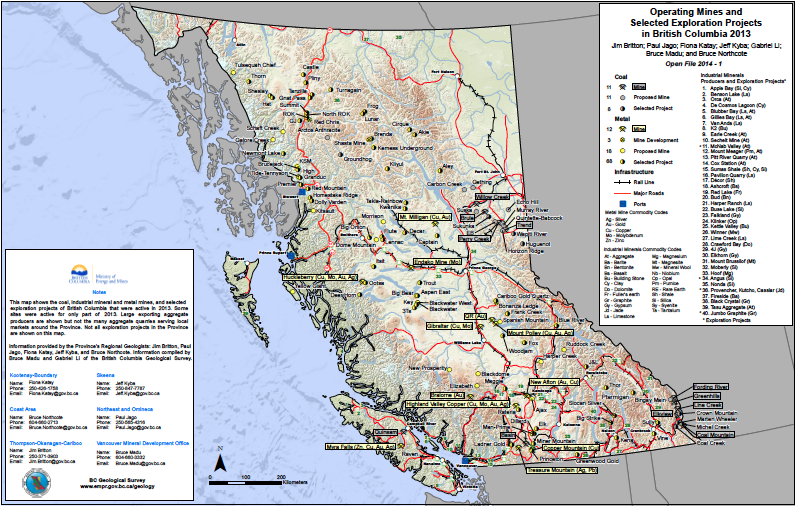 Operating mines and selected exploration projects in British Columbia, 2013, by Ministry of Energy and Mines. Click map for a larger version. If you are reading this in the print version, see the attributions list for the full link to the resource. It seems, then, that mining is of great importance to the province of BC and to its local and international economy. But what are the social and environmental costs associated with the mining of natural resources in BC? The greatest social cost has been the access to land and the land rights of BC’s First Nations. Up to now the BC government has signed 14 economic development agreements with First Nations across the province. These agreements commit the provincial government to share up to 37% of the BC mineral tax from mining operations collected within First Nations traditional territories. Two recent agreements signed with First Nations involve the Huckleberry Mine, a few hundred kilometres from Williams Lake , and the Gibraltar Mine. Mining also presents environmental costs. BC’s diverse and pristine physical environment is highly regarded a reason the province is promoted as being one of the best places to live, but mining is threatening this. Water is mining’s biggest casualty and affects all of BC’s residents. There have been several threats to groundwater sources, which is where we get our drinking water from, including in the Greater Vancouver and Victoria areas. The second case study in this chapter focuses on an operational mine and the impact it has on the local people, specifically First Nations people, and the environment. Mining in BC by Geography Open Textbook Collective is licensed under a Creative Commons Attribution 4.0 International License, except where otherwise noted.